I haven't had much time to blog the 2020 Kansas State Fair, but before the last weekend of it continues I have to mention that one of my favorite attractions, The World Of Wonders sideshow, is back this year. 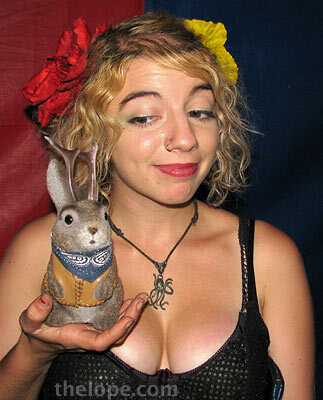 This lovely young performer holds Ace as he asks if a real jackalope could sign on. The World of Wonders is located at the north end of the carnival and contains performers and exhibits that hearken back to the glory days of the circus freak sideshow. The stuff your grandparents paid a few coins to be amazed or irritated by costs only $3 now, plus an optional buck to see "Dr. Frankenstein." Sorry - I'm out of time again. You'll just have to go see.